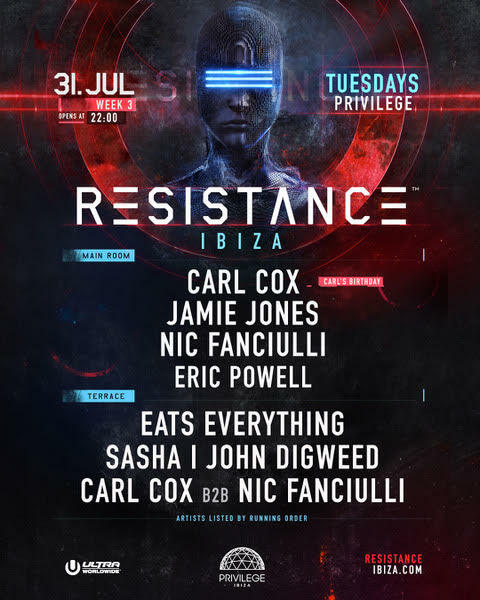 RESISTANCE Ibiza is set to serve up another huge and exclusive party on Tuesday July 31st, with none other than Intec boss Carl Cox celebrating his birthday at Privilege. Jamie Jones, Nic Fanciulli, Eats Everything and Sasha & John Digweed also join the line-up for a sure to be spectacular celebration. Carl Cox is the absolute king of Ibiza. Whenever he plays, clubs sell out and crowds go wild. His birthday is always an extra special one that has become a sort of national holiday for Ibiza party types. The big man will play a celebratory set that features guests like Paradise main man Jamie Jones, Saved Records chief Nic Fanciulli plus the legendary Sasha & John Digweed and party starting Eats Everything, with the famous RESISTANCE production throughout the club ready to blow your minds next to the world class soundtrack. To make sure things get going from the get-go, the night will kick off with an exclusive Carl Cox B2B Nic Fanciulli set in the terrace room. This all comes just a week after Richie Hawtin hosted his PLAYdifferently party at the club with the likes of Dubfire and Nicole Moudaber. This week is set to be another historic night at RESISTANCE, which has already established itself as the most essential party in Ibiza.